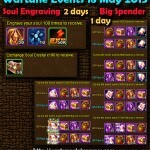 Hey everyone, in this article I share the Wartune Events 20 May 2017 (article + video). Rewards can be taken one time per day only! Rewards can be taken one time only! 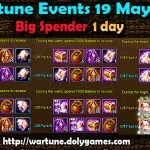 Epic Spender (3 days) – 2000 to 30000 balen spending rewards incl. level 9 will crystal, 1000 Smelting Stones and more. I believe you need to ask again… pretty sure hardly anybody understands what you would like to know. There is only one holy forge event… and you can holy forge lower equipment just as you can use upgraded equipment. 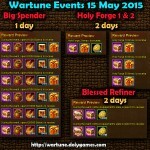 Hi, there never was an “Advanced” Holy Forge event and there is no evidence or communication from Wartune’s owners that they are planning to create something like that. Apart from that I agree that R2 is a horrible organization as not only they have undertaken harassment/attacks against me but there have been a huge number of players complaining about them. 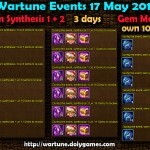 i know there are 2 diffrent chinese wartune versions, 1 that is difftent from our and 1 thats almost like our. when i look in the wartune wiki i only find the one who is diffrent. 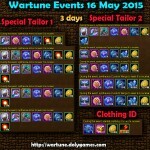 anyone has a link to the chinese wartuen version thats like our wartune? 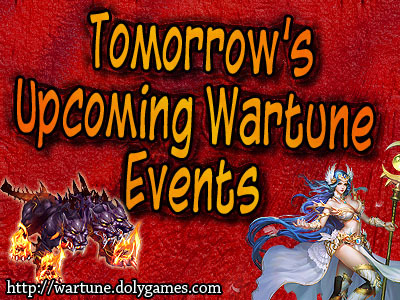 May I post a link to your wartunes page to our facebook group page?